The dances of the Greek people are many and varied. The great majority of these dances are done in a semi-circle moving counterclockwise. Some dances are for men only, some for women only. There are a few dances that are done in couples such as Ballos and Karsilamas, and there are some dances that are for a solo dancer, such as, Zeimbekikos. Each area of Greece, often each village, has its own dances. Often, two areas will do the same dance, but with different variations or styling. We can even see the same footwork or dance steps done to many different types of music so that it appears to be a completely different dance. Some dances are common to all Greeks. Examples of these panhellenic dances are: Syrtos, Kalamatianos, Tsamikos, and Hasapikos. These dances, like many of our western social or ballroom dances, are done to an infinite number of tunes. They are not done to only one melody, but to any song with the correct rhythm for the dance. 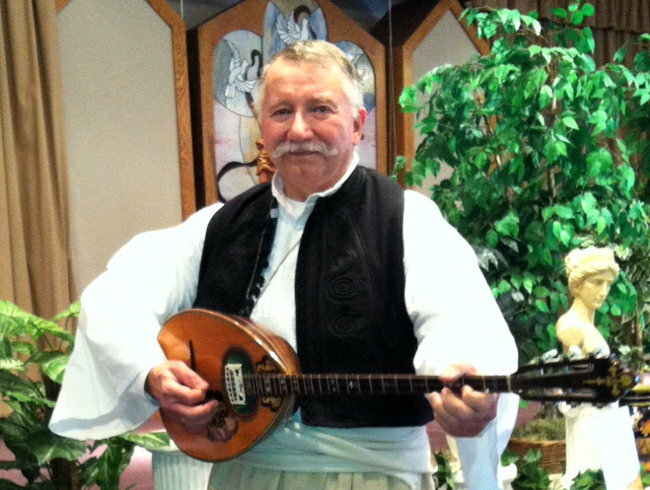 Greek music is different from the music of western Europe. Whereas the average American is used to rhythms in 2/4, 3/4, or 4/4, the Greek sings and dances to rhythms such as: 2/4, 5/4, 6/4, 7/8, 9/8, 8/8, and 12/8. Furthermore, Greek music uses more than just the normal major and minor scales of western music. 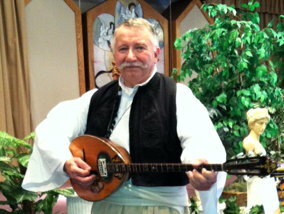 The Greek musician uses intervals such as the quarter tone, and techniques in playing which a trained musician of western music could not duplicate. Most Greek musicians are self-taught and don't know how to read music. Just as the dances vary from area to area in Greece, the music and instrumentation in each area tends to be different. Basically, there are two main areas: the Mainland and the Islands. Each of these is further subdivided; the styling of dance and music within each of these subdivisions is similar. One other main group of dances and music is the city or tavern where dances such as Argo Hasapiko and Zeimbekiko are done. In general, all dancers stand straight and proud. Whereas men often have high leaps and large motions in the dance, women usually dance more sedately. They do not swing their legs very far; their feet do not usually lift very far from the ground. Some of the reasons for this are: the women are lady-like and therefore dance in a lady-like manner. Another point is their costumes. The women's clothes are usually multi-layered and quite heavy. Their skirts are also quite long. When dressed in such clothes, it is not easy to kick your feet very far. Also, because of the length of the costumes, large movements of the legs cannot be seen anyway. WHAT DOES ONE DO WHEN LEADING? If you are dancing at the right end of the line or semi-circle (leading), your right arm never just hangs free. The right arm is either held straight out to the side at shoulder or head height, or it is placed on the right hip. Usually, women tire more quickly than men, so it is more common for a woman to have her free hand on her hip. Either position, however, is correct for men and women. If you are at the left end of the line (the last dancer), you do the same thing with your free hand. There are some dances where only the leader can improvise turns, leaps, or slaps to the feet. Such dances are: Syrto-Kalamatiano and Tsamiko. Other dances, such as Hasapiko and Sta Tria allow all dancers to do simple variations, such as, turning or step variations. Find out whether you are supposed to follow the leader before you attempt to do his variations. And when leading, remember that the variations you do in Syrto or Tsamiko need not be extremely fancy. The leader is not trying to impress anyone. A leader's variations are an expression of his feelings in the dance. They are, therefore, an expression of personality and not intended to dazzle anyone watching (even if they are dazzling in effect). A simple turn or two is often more beautiful than 220 slaps of the feet and standing on one's nose to impress the people watching. Copyright © 2014 by John Pappas. Do not reproduce without permission. Reprinted from the 1969 University of the Pacific (Stockton) Folk Dance Camp syllabus.